Town Centre Dental is proud to provide Mississauga and Oakville patients with the latest technology in oral cancer screening. 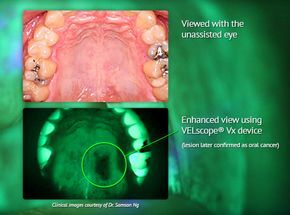 The VELscope Vx is a simple, two-minute exam that our dental office is now providing to patients. The VELscope Vx helps us identify our oral disease early, while it’s still easy to treat. 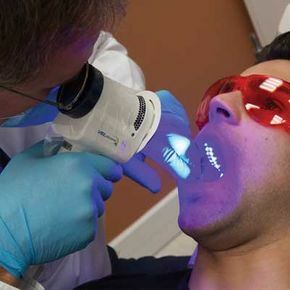 One of the VELscope’s most important tasks is to help locate areas that might, if not treated, progress to oral cancer. How many little sores do we find in our mouths? Dozens? Hundreds? More? Most of the time we ignore them, and they simple go away. But sometimes our mouths keep secrets. That’s why we use the VELscope Vx Enhanced Oral Assessment System. Town Centre Dental is proud to provide the most advanced standards of care available to our Mississauga and Oakville patients. Call us today and ask about our available VELscope Vx exams.